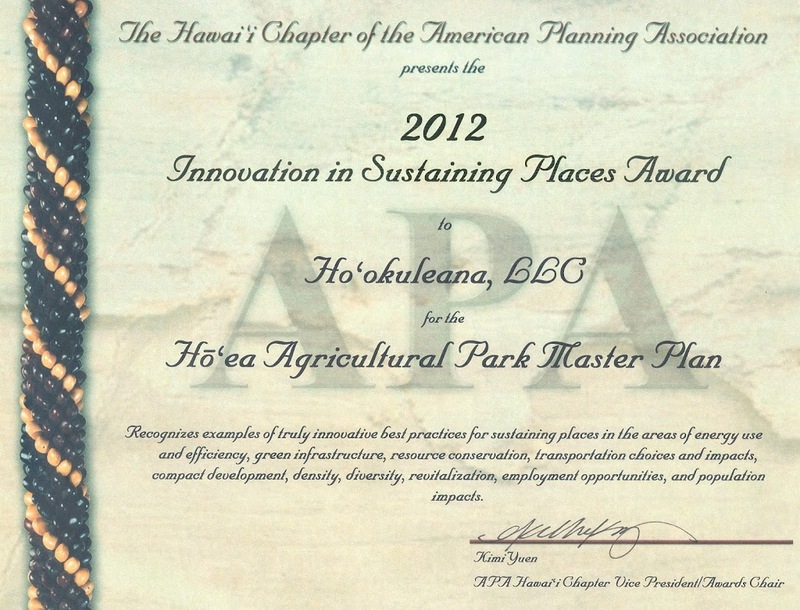 We are proud and honored that the American Planning Association – Hawaiʻi Chapter awarded Hoʻokuleana LLC with the “Innovation in Sustaining Places” for our preparation of the Master Plan for the Hō‘ea Agricultural Park. 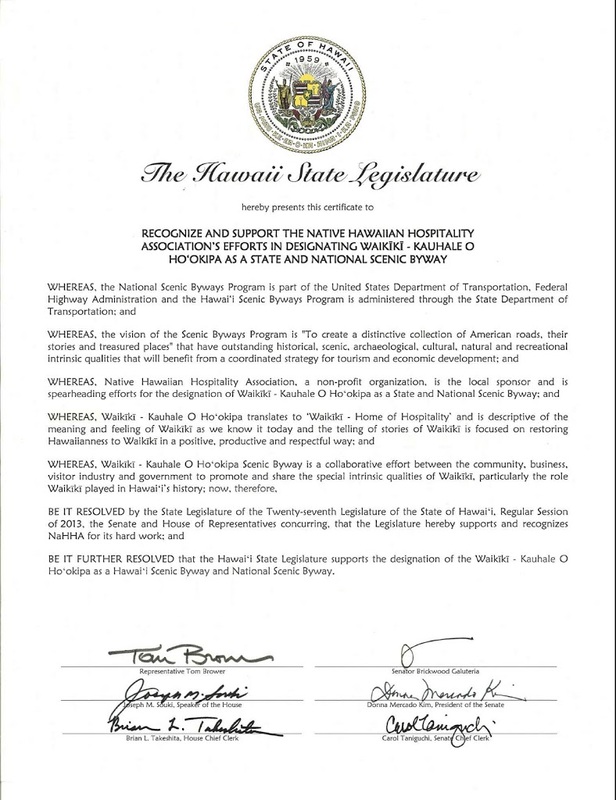 This is the third year in a row that we received an APA-Hawaiʻi award. Last year we received the “Environment – Preservation” award for the Corridor Management Plan for the Scenic Byway on Aliʻi Drive in Kona and the year before we received the “Environment – Preservation” award for the ʻĀina Mauna Legacy Program forest and habitat restoration. Hō‘ea Ag Park is a proposed private agricultural park situated at ʻUpolu Point in North Kohala on the island of Hawaiʻi. The core of the agricultural park is 450‐acres of actively farmed fee simple privately‐owned property. In addition to the conventional land use layout, we included specific management and operational recommendations in the Master Plan. These were made to help assure that food will be the focus, goals/commitments are being addressed and tenants are on track to fulfill the mission and vision. In a sense, the Ag Park management philosophy views the overall Agricultural Park more like an integrated farm, rather than an assemblage of independent, individual farms. The context in which the Master Plan was prepared, particularly in relation to the overall Agricultural Park management strategy, addresses strong and recurring themes of Tradition, Sustainability, Integrated Holistic Approach, Long‐term Timeframe, Cooperation and Collaboration, Diversity of Foods and Economic Viability – melding Hawaiian traditional wisdom with modern sustainability concepts. The vision of the Hō`ea Agricultural Park is the development and management of the agricultural park as a diversified, collaborative, sustainable system that provides land access and farming opportunities for multiple small farmers whose production, marketing and education activities support local food availability, that is economically viable, environmentally sound and provides value for all participants – the North Kohala community, farmers and Hawai`i County residents. Ultimately, this is demonstrated by fulfilling the goal of: Food from Kohala for Kohala. 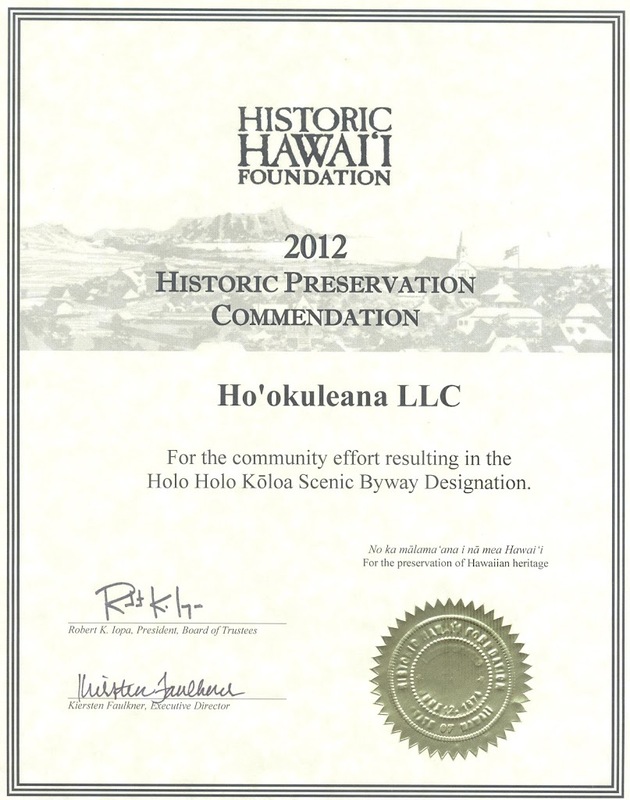 More information on Hoʻokuleana LLC can be found at www.Hookuleana.com.